When Rebecca and I visited New York City two years ago, we did a lot of walking and explored almost every neighbourhood on the island of Manhattan. 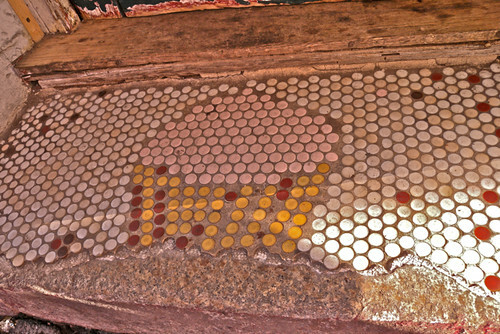 On one sun-soaked late afternoon, I dragged her to the Lower East Side, over the tiled cupcake doorstep and into celebrity favourite Babycakes for some vegan baking. Any skepticism Rebecca had was hidden well as we indulged in gluten-free, (refined) sugar-free vegan cookies with gooey vanilla frosting sandwiched between them. 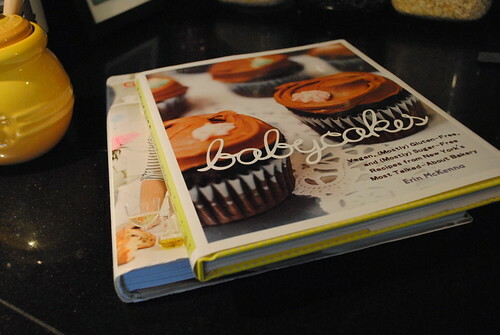 Fast forward to 2012 and I finally got my hands on a copy of Babycakes’ official recipe cookbook, a cookbook I recently cracked open a few weeks ago. 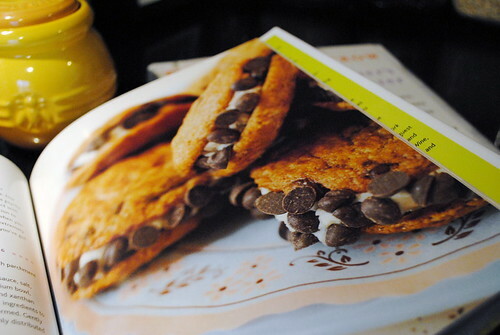 In paying tribute to our visit to the bakery, my first project would, naturally, be the cookie sandwiches. After a quick (yet wallet-draining) trip to Whole Foods, I had everything on hand to whip up the recipe. 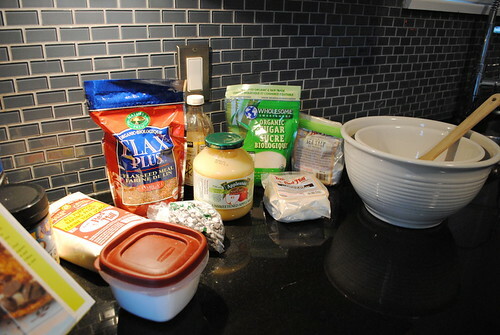 However, once everything was laid out on the counter, I felt more like I was commencing a scientific experiment. Apart from being entirely vegan (yes – even the frosting! ), Babycakes’ other claim to fame is that they’re mostly gluten free. 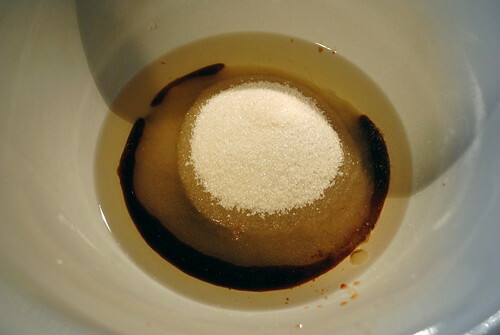 And on top of that, the baking could almost be considered healthy as the recipes use natural sugar substitutes such as agave syrup and evaporated cane juice rather than refined sugar. 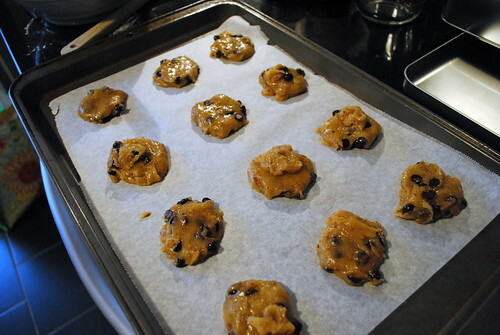 Baking without butter, eggs and sugar was fixing up to be entirely new territory for me. So could I do it? Of course I could! But not without the assistance of my lazy sous chef/pastry assistant, Jordles. 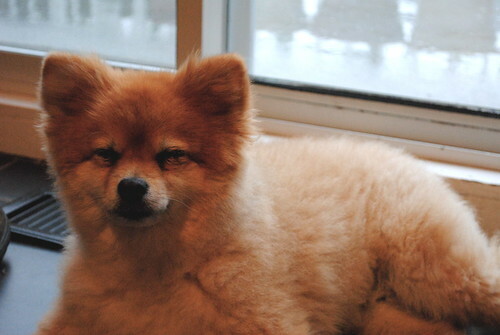 Most of his time “supervising” was spent curled up by the patio door in a zen-like state. Shocking. No matter what you’re making, if you don’t have the tools of the trade, you’re in for a difficult task. Luckily my aunt thought to buy me measuring cups and spoons for three Christmases in a row, so I’m well-stocked in that department. 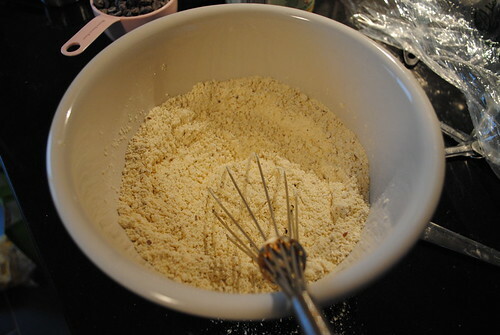 Next comes the mixing of the flours and dry ingredients. As with anything baked, good quality baking soda that hasn’t expired is a must. 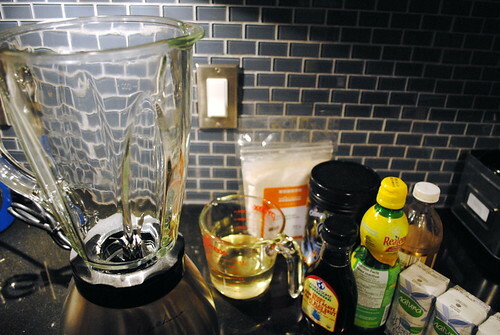 And because I wasn’t using eggs, this is the part where I added a bit of xanthan gum. 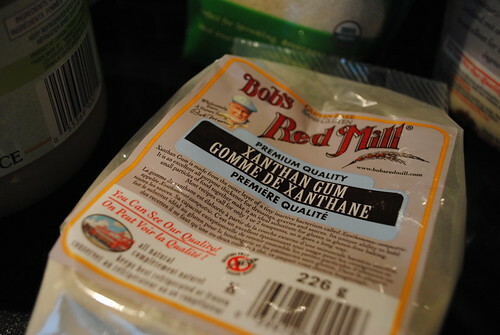 What is xanthan gum, you ask? It’s a carbohydrate molecule derived from a natural bacterium. 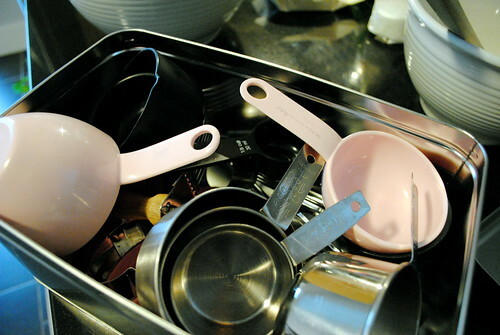 It’s used to thicken food as well as to stop food products from separating. A one-cup bag will set you back about $15 but a pinch goes a long, long way. Next up? The chips. 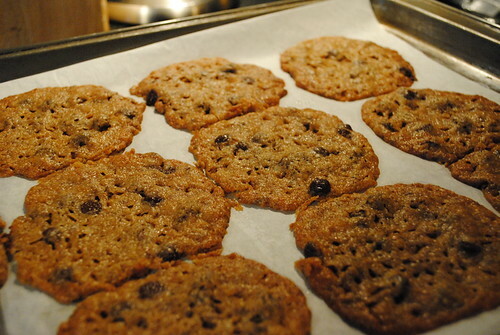 And in this case they were carob, simply because I wanted to make these cookies vegan through and through. The verdict? Blech! J loved the cookies with the carob chips but I preeeeeeetty much hated them. Similar to dark chocolate, plant-based carob is a safe chocolate alternative to have in a home where you’ve got a dog that likes to eat anything and everything off the floor (see my sous chef above). However, next time I’ll just use my much-loved Nestle Tollhouse Morsels because, well, I’m not vegan and I love me some real chocolate. 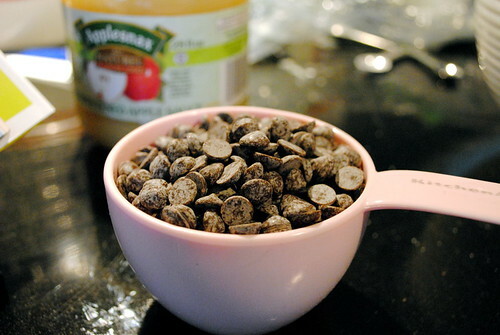 By this point, I had something in my bowl that closely resembled cookie dough. It smelled like cookie dough. And yes, it certainly tasted like cookie dough. 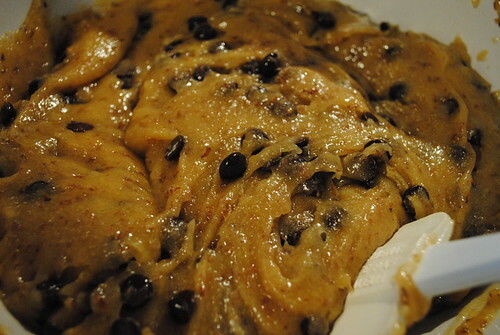 Everyone knows that all diligent bakers simply must test the cookie dough, right? 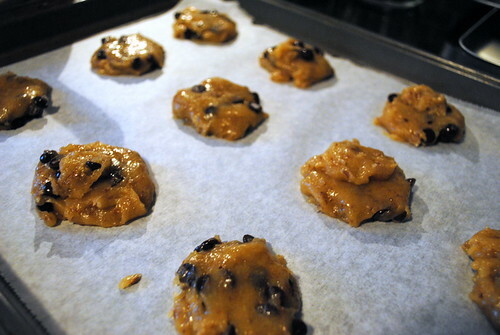 …however, I ended up with paper-thin cookies from my first batch because the dough had spread so much while baking. 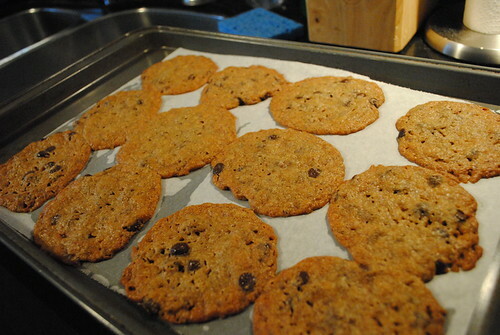 The second dozen I refrained from pressing down and ended up with slightly more structured cookies. Once the cookies were baked and cooling, I was ready to move on to the frosting. If the idea of vegan cookies sounded strange, the notion of making vanilla frosting without any dairy products whatsoever seemed downright insane to me. 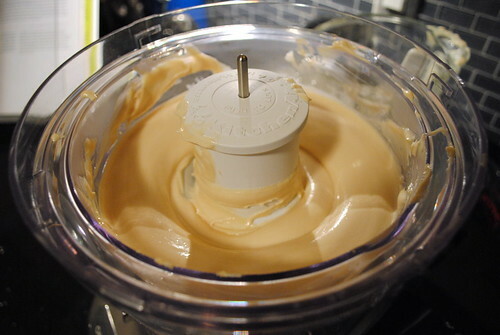 The recipe even specified that the frosting could – and should – be made in a blender! 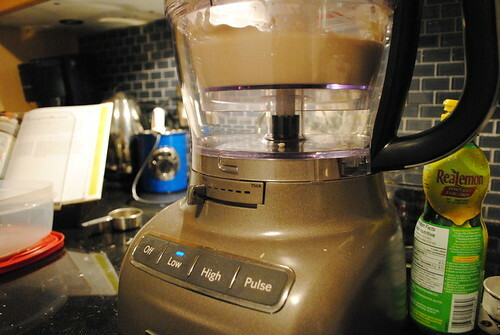 I knew that in no way was my ages-old blender up for the task of making frosting and that this was a task for KitchenAid. 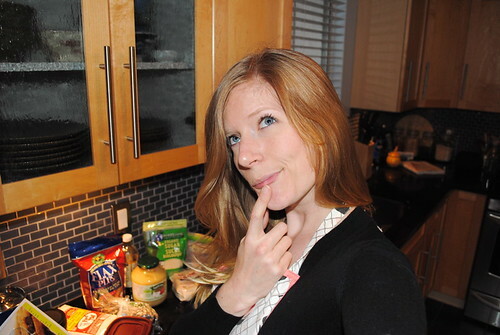 I gladly hauled my 13-cup food processor – the food processor of all food processors – onto my kitchen counter. 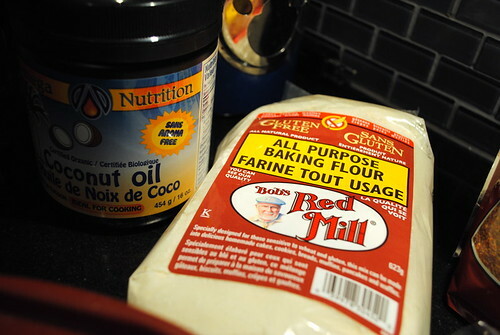 Only a handful of ingredients later, including to-die-for coconut flour, et voila! I had thick, creamy, amazingly emulsified, sweet ‘n sticky vanilla frosting. 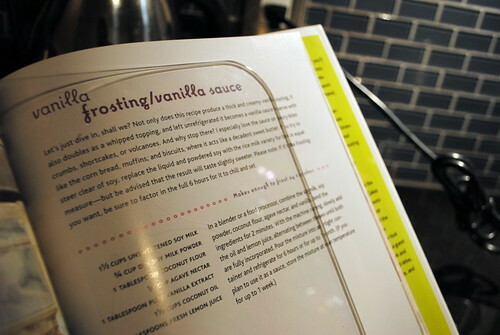 The frosting recipe requires a minimum of six hours of refrigeration to bring it to Babycakes’ bakery standards, which I did. 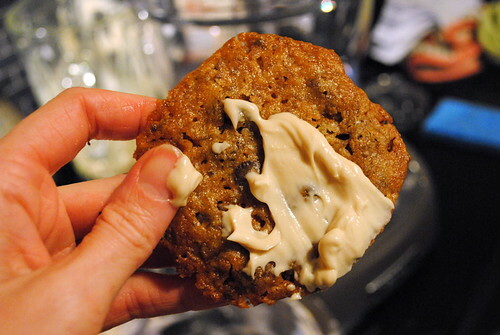 But I couldn’t resist dipping a cookie in the slightly goopy frosting for a mouth-watering preview. Would I do things differently next time? Definitely. Apart from the obvious chocolate-for-carob swap, I’d also use rice milk instead of soy milk in the frosting because the soy flavour can be overwhelming if you’re not used to it. As good as they look…I sure hope you do some of your amazing cupcakes for my visit…carrot maybe with cream cheese frosting??? ?